Everyone has scary dreams. Lately Wall Street's nightmares always seem to involve chaos in China. More than plunging oil prices, the strong U.S. dollar, turmoil in Greece or a Federal Reserve rate hike, investors remain preoccupied with China -- and for good reason. Concerns about China ratcheted higher this week after the country shocked the world by devaluing its currency. That raised the specter of a global trade war or that Beijing was panicking over a more severe economic slowdown than expected. Chinese officials already spooked global investors with their heavy-handed response to the crash in stock prices earlier this summer. "Could it be that they really don't know what they are doing? I think so, and I think that is starting to seriously unnerve investors around the world," Ed Yardeni, president of investment advisory Yardeni Research, wrote in a note to clients. The biggest reason why China matters is size. Unlike Greece, Puerto Rico or other one-off situations, China has the scale to impact the entire globe. It's now the world's second-largest economy, blowing past Japan and Germany in recent years. China is also the biggest consumer of raw materials like oil and copper, both of which have plunged in recent weeks. A more dramatic decline in Chinese growth could cause commodities to crumble further, unleashing financial havoc on countries that rely on those natural resources. "That could result in a debt crisis somewhere in the world. In other words, China's mess may be about to provide more than enough critical mass for a global meltdown," said Yardeni. For much of the past 15 years, China has served as the key catalyst to global growth. But China's economy is maturing, with growth slowing from 10% in 2010 to just 7% in the first half of this year. 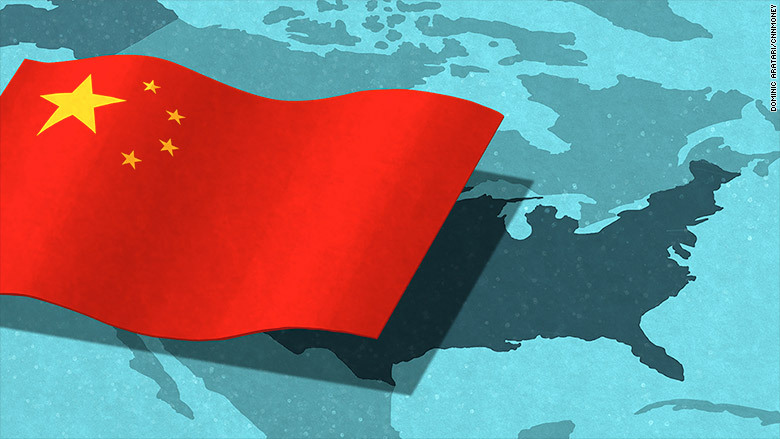 "Investors look to China as this magical economic utopia where things go up by three times the amount you see in other nations and will do so forever," said Sam Stovall, chief investment strategist at S&P Capital IQ. But now reality has set in -- and it's creating headaches for companies with significant exposure to China. That includes American multinationals like Apple (AAPL), General Motors (GM), Nike (NKE), Starbucks (SBUX) and KFC owner Yum! Brands (YUM). "Where China exposure was once a source of optimism and significant potential growth for U.S. stocks, it has become a source of disappointment in recent results, from autos to TVs to iPhones to machinery," Bank of America Merrill Lynch analysts wrote in a report. A strong U.S. dollar is great for American tourists traveling overseas, but it can be a problem for companies based here. When the dollar gains on its rivals, it makes goods sold overseas more expensive. The greenback's breathtaking rally over the past year is only being boosted by China's decision to devalue its currency. That's one reason U.S. stocks tumbled earlier this week on the surprise move. Deflation could be shipped to U.S.
China's slowdown is putting downward pressure on prices there. Wholesale inflation has declined on a year-over-year basis for 41 consecutive months through July, according to Yardeni. That's not healthy. The concern is that deflation -- something there is no easy fix for -- could spread from China to other countries. It's already caused prices for raw materials like metals and oil to decline. If signs of deflation emerged in the U.S., the Federal Reserve may need to delay or scale back its plans to raise interest rates. "Inflation is the missing piece in the U.S. It's still nowhere near where the Fed wants it to be. You get a move like this, it brings the threat of deflation back to life," said Nicholas Colas, chief market strategist at ConvergEx. Much of China remains shrouded in mystery. That's because many investors believe Beijing's official statistics are fudged to make the economy look better than it really is. In other words, China's economy may actually be in worse shape than people realize. "It's like the Wizard of Oz: A lot of this is done with smoke and mirrors behind the curtain," said Stovall. China's recent actions aren't helping either. To the dismay of Western investors, the Chinese government helped inflate the bubble in the stock market and later took an overly-aggressive approach when prices crashed. And then the currency devaluation came out of the blue. Beijing risks more than just offending investors. Future efforts to revive growth will likely be greeted with increased skepticism from the markets. "While spending programs and rate cuts may provide some relief, confidence in their efficacy is waning," Bank of America Merrill Lynch wrote.